Line a small baking sheet with 12 silicone baking cups. Spoon approximately 2 tablespoons of yogurt into the bottom of each cup. Top with granola, pressing the granola down slightly into the yogurt. Freeze until firm, about 3-4 hours. Remove from freezer and enjoy immediately. Serve with fresh fruit, if desired. 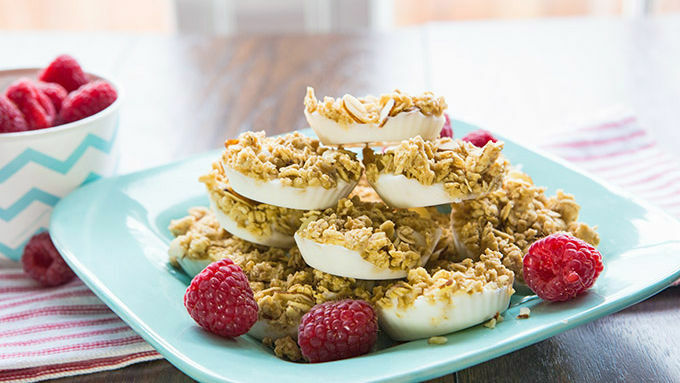 Flavor twist: Swap in any Yoplait® Greek 100 yogurt for a delicious twist on this simple recipe. Coconut is especially delicious! Go granola: Pair Chex™ Berry Granola with fruit-flavored yogurts for a fun and fruity twist on this simple recipe. Dealing with a whole lotta on-the-go mornings? You know the ones we’re talking about. Those hit-the-alarm-and-start-running a.m.’s. Those sunrises that see you climbing into the car before you’ve even enjoyed a decent breakfast. Just in time for summer, we’ve got the perfect solution. 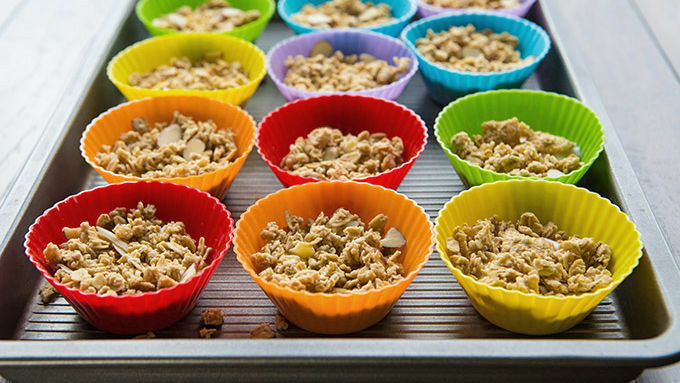 This yummy recipe won’t slow down your mornings at all, but it will give you a freezer full of ready-to-eat Fro-Yo Oatmeal cups, perfect for those grab-n-go moments when you don’t have time to cook but need something nourishing—quick! Like a little three-bite bowl of oatmeal, these fun frozen treats top creamy vanilla Yoplait™ Greek Yogurt with crunchy Chex™ Granola. Simply spoon, stack, and freeze. Three hours later, you’ll have satisfying little fro-yo bites, cool enough for hot summer days, easy enough for wild workdays, and fun enough for everyone from kids to grown-ups. You can make ‘em with any flavor yogurt, but vanilla is a classic. Note: If you’re going to freeze your cups for longer than 12 hours before enjoying, cover them firmly in plastic wrap avoid freezer burn. We love letting them melt just a bit for the ultimate bite-ability, but eat ‘em however you please. They are scrumptious no matter what. One last trick: Store your fro-yo bites in an airtight container. They should last for 2 to 4 weeks, as you’ve got them icy cold and covered. Boom!